There are two important factors that made the Viking achievement possible. Firstly, the Vikings were a maritime people who were able to build ships that were the best in the world at that particular period of time. Secondly, the Vikings mastered a sophisticated martial art that allowed them to successfully fight against anyone who dared to meet them in armed combat. A lot of historical and archaeological research has been put into the Viking ships, but almost none into the Viking fighting arts. This presentation is as a ‘little teaser’ detailing aspects of this fascinating subject that await further research – an area of historical study which is equally important for our understanding of the Viking age as the maritime angle is. The Vikings fought both on land and at sea. Their martial art was mostly a close combat fighting system, where axe, sword and spear were the most preferred weapons, but they also used distance weapons, such as bow and arrow and stone throwing. The most skilful and fearful of the Norse warriors were the berserkr, who were also regarded as the warriors of Odin. Heimskringla (Ynglinga-saga, 6) states that Odin had the power to make his enemies blind, deaf or terrified in battle and that their weapons had no more bite than the soft branches of a tree. The warriors of Odin fought without armour or chain mail, and it was said that they had the power of the mighty bear and the deadly wolf. When the berserkr were engaged in battle they possessed a fighting spirit that made them insensible to pain and oblivious to any harm that was inflicted on them. This phenomenon was called beserksgangr or berserk-fury. The berserkr have been wrongly portrayed in later centuries as deranged warriors, crazy people, who possessed almost no fighting skills. But if we read the oldest Norse poetry from late 9th century (Haraldskvæði, 8, 20, 21) we find out that the berserkr were the most admired and honoured warriors amongst the Vikings themselves. If we look at the Norse Viking Age society, we notice that they lived in a world where all the free men were supposed to know how to fight. In the old Laws of the North you could always solve a dispute by challenging the other to an einvigi, holmgangr or a duel. This meant that anyone could lawfully take away all your possessions and your life if you did not have the strength or skills to defend them with weapons in hand. The other thing that represented a constant threat to the individual’s life was the custom of blood-revenge, which made all the male relatives in a family an accepted target to kill for other families who had a vendetta against them. Therefore every male family member had to foster fighting skills at an early age and be able to keep these skills intact throughout their lives. The Norse community had a very special way of fostering efficient fighting skills attitude. This training system was called Glíma or fangbrögð. With Glíma you could enhance the physical fitness and pass on the fighting skills needed from the old to the new generation – and this was done in a playful way that had a lot of useful and pedagogical values. Glíma (or Glímur in pluralis) was the old Norse name for the unarmed combat training that later in history became a term for traditional wrestling. Glíma could be practiced in three different styles – buxnatök, hryggspenna and lausa tök. In buxnatök and hryggspenna they wrestled with fixed grips that were taken before the fight began, but in the lausa tök you had to wrestle for the grip. Buxnatök or the Trouser-grip was the technical and most advanced form of Glíma, because in this style the wrestlers had to fight with an upright body-position. It was forbidden to resist the opponent’s movements with pure strength. It was therefore necessary to carry out all defensive manoeuvres in an evasive way. In Glíma you learned that it was good if the opponents attacked you, because every defence was the beginning of an attack. The buxnatök style of Glíma was recognised for its very advanced legwork which was used to knock the opponent off balance. Hryggspenna or Back-hold was a more strength-consuming form of Glíma, because in this style you were allowed stand in a stiff and immovable position with your back bent forward and you could also use all your strength to hinder the opponent from wrestling you down to the ground. This meant that the hryggspenna was used as a method to enhance the kind of fighting spirit, physical endurance and stamina that were useful to have on the battlefield where fighting could be prolonged. In modern terms we could say that the hryggspenna was a form of active fight-meditation that was learnt under very harsh and strenuous circumstances. Lausa tök or Free-gripping was a kind of self-defence wrestling that was very close to the way you wrestle when you can use every means possible to stay alive in a fight, and at the same time try to overpower your opponent so that he is no longer a threat to you. It was the lausa tök style of Glíma that was used in a fight-situation where life was at stake. The most useful thing that the Glíma-practice imparted was a good sense of balance. And to have a good balance and be able to quickly regain your lost balance are of course the essence of all fighting styles in the world. The upright body-position that was used in the buxnatök style of Glíma made it very easy for the wrestler to change from unarmed combat-exercise to weapon-training, because you already had the straight back that you needed in fighting with weapons. The relaxed body-movement that was not strength-consuming and the intuitive fighting attitude that all the three styles of Glíma fostered were useful things to master on the battlefield. The buxnatök style of Glíma was practiced in the Scandinavian mainland of Norway, Sweden and Finland at least up until the first half of the 20th century. After that time it has only survived as an unbroken tradition in Iceland, where it is actually designated the official ‘National Sport of the Nation’. Since the late 20th century it is once again practiced in Sweden, Norway and Denmark. The hryggspenna style of Glíma was practiced in Scandinavia up until the end of the 19th century:in Denmark and Iceland, and up until the first half of the 20th century in Norway, Sweden and Finland. 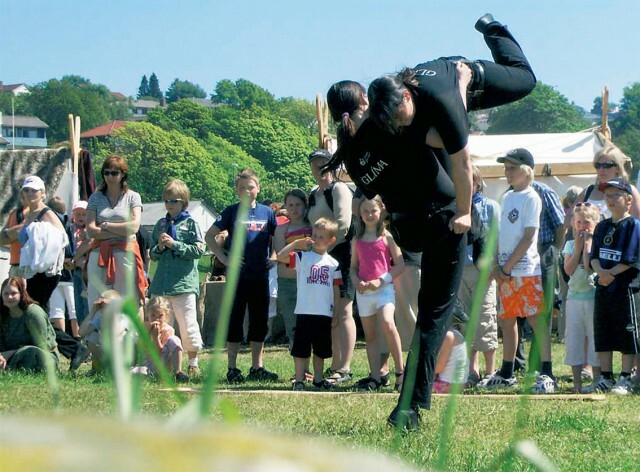 Nowadays hryggspenna is still practiced in unbroken Viking-tradition in the North of England and in Scotland, where it is called Cumberland-Westmoreland wrestling or Back-hold wrestling. From the late 20th century it has experienced a rebirth in Iceland, Sweden, Norway and Denmark. The lausa tök style of Glíma was still practiced by the soldiers in the armies of Scandinavia in the late 19th century and the early 20th century, but since then it has emerged with modern hand to hand combat training. Techniques from all the three styles of Glíma can also be found in the modern Olympic wrestling styles (Greco-Roman wrestling and free style wrestling). The most obvious Glíma influence is the hryggspenna grip which is used in Greco-Roman wrestling, which, more correctly, should be called French-Finnish wrestling because it was developed in these two countries in the second half of the 19th century and had nothing to do with the historical wrestling styles of ancient Greece or the Roman Empire. Lausa tök Glíma and its self-defence applications have been recreated since the late 20th century by older Glíma-masters in Iceland and younger practitioners in Scandinavia and Europe. The leading person in this theoretical and practical project is Lars Magnar Enoksen. It is difficult for a martial art to survive in an old form longer than 150–200 years, because warfare always changes when new weapons are invented making ancient combat styles and forms obsolete. A sport, however, has better possibilities to keep and preserve old rules for a much longer period of time. If we look at the Viking society, it seems that there were many changes going on in Scandinavia in the 11th century. As far as the character of fighting and warfare were concerned the traditional Viking raids changed to army operations during this century. A new religion and stronger national kingdoms finally took power, imposing their political and military control over the Scandinavian nations of Denmark, Norway and Sweden. 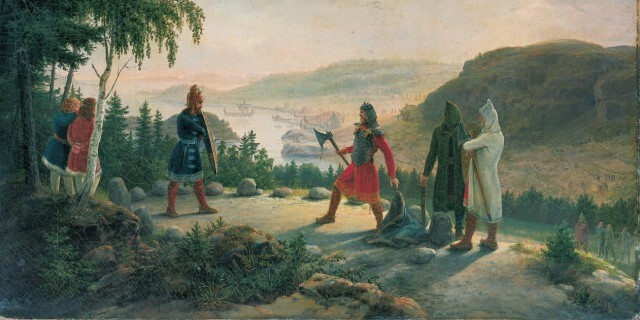 In the beginning of the 11th century the representatives of Christianity were able to ban the duel form einvigi and holmgangr as a lawfully accepted means of solving disputes, and at the same time the berserkr and the beserksgangr were also made illegal. Later on in the same century the new religion also worked hard to change the custom of blood-revenge. The change from a pagan warrior religion to Christianity, and the fact that the old duel forms, the blood-revenge of the family vendettas, and that the famous bear-warriors were no longer around – were important features that changed the old Viking style of hand-to-hand combat forever. Even if the Scandinavian warfare changed in the 11th century, the male population of Scandinavia was still expected by its kings to be fit for fighting and military activities. The leiðangr or leiðungr or the people’s maritime army (founded in Norway c. AD 940), was still used in the 13th century and made it necessary for the population to know the basics of hand to hand combat and weapon fighting. It is possible to find some references to the Viking style of fighting in the Norwegian Konungs Skuggsjá or the Kings Mirror from the middle of 13th century and the Hirdskrá or the Warrior code from the end of the same century. 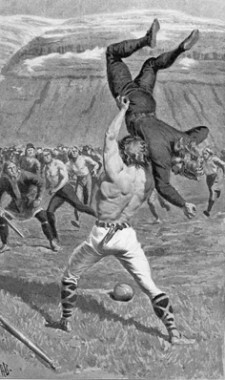 In Glíma the old Viking training systems of handto-hand combat could survive when it was made an iþrottir, or a sport in the modern meaning of the word. The old concept of drengskapr, or fair play, taught the Glíma-wrestlers to uphold the warrior code of how to behave in an honourable way when training in hand-to-hand combat. The concept of nið or foul play was taught both to lessen injuries and to learn what kind of techniques you used in a self-defence situation. Glima-queens from Iceland demonstrating their art at the 2006 Hafrsfjord Festival in Stavanger, Norway. The fact that Glíma was guarded with very strict rules already in the early 12th century in Iceland (Grágás; Vigsloði chapter) and in the late 13th century in both Norway and in Iceland (Jónsbok; Manhelgi chapter) is referred to in the medieval Law-books of the North. In modern Glíma, or the way Glíma has been practiced since the late 19th century and the early 20th century, we still find the old rules of nið and drengskapr, which is still regarded as the essential concept of Glíma-practice. Do not think that Glíma has survived in a unbroken tradition since the Viking age only because it is a great fighting system. The reason why Glíma has survived has more to do with it often being used as a quick and efficient way to heat up the body when it is cold and it has also enabled practicioners to retain a strong and agile body up until a fairly old age. Remember that the Viking warriors were supposed to be vigr or in fighting shape at least until they were 60 years old as it is said in Heimskringla in Óláfs saga Tryggvasonar before the Battle of Svoldr. This article by Glima master Lars Magnar Enoksen was first published in the book Viking Norway. Translated by Stephen R. Parsons. He (b. 1960) is an expert on historical Viking culture and has written 26 books about Norse Mythology, The Runes and Viking Martial Arts. He hold chair no. 1 in The Academy Of Scania and is President of the Southern Scandinavian Writers Guild as well as the Swedish Martial Arts Federation. All Nordic Glima Champion 1995 and National Champion 1992, 1998, 2005 and 2006. National Master-class (seniors) Champion 2013 and 2014.